June 2018 Food of the Month - Strawberries — Spectrum Health Services, Inc.
Now that June is upon us it is officially strawberry season! 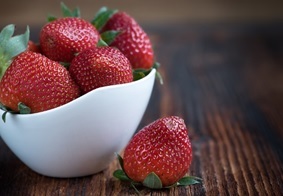 Fresh local strawberries at great prices will soon start popping up everywhere you shop, from farmers markets to grocery stores, so now is a great time to add some of this colorful fruit to your diet. These red gems have over half your daily needs of Vitamin C in just one cup and make delicious additions to oatmeal, yogurt, cereal, smoothies, and salads. Whether in a mixed dish or just washed and eaten straight out of the carton, the flavor this time of year will not disappoint!